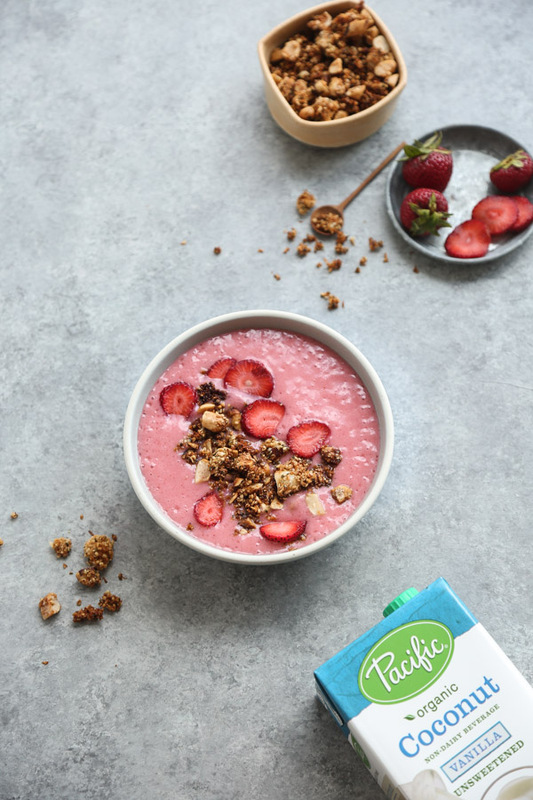 This strawberry smoothie bowl recipe was created in partnership with my friends at Pacific Foods. Thanks as always for supporting the brands that make all my breakfasts champion-like! 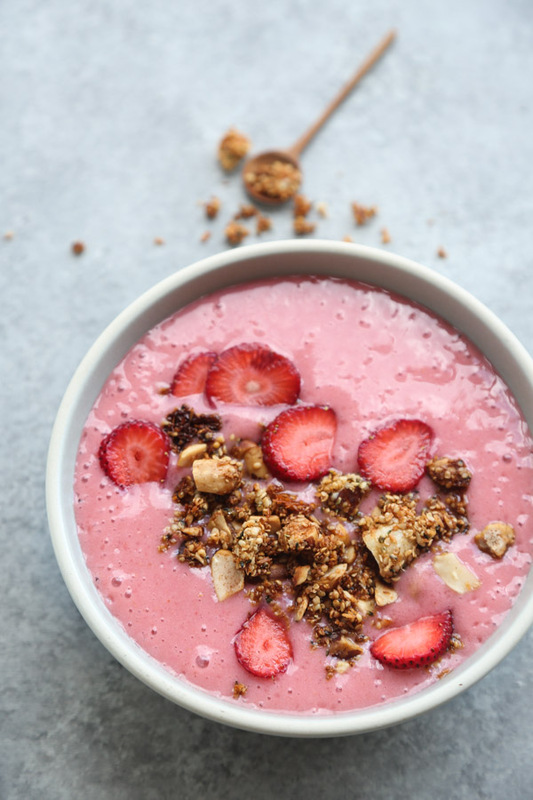 For more recipe ideas, check out their Non-Dairy Made Easy guide. 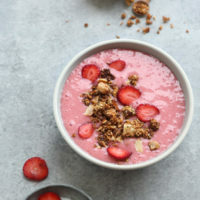 My guests this weekend arrived as the best guests always do with a Tupperware container of Farmer’s market strawberries that had been salvaged from their countertop and swiftly, yet lovely, sliced at 7am Saturday morning before leaving for the airport. They were also a small silver-lining to what had already been a nightmare travel weekend. 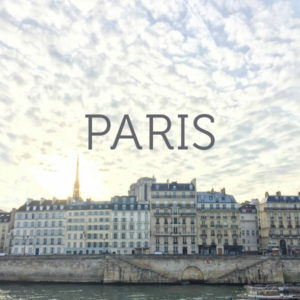 On Friday night, Charlie and I watched our Flight Aware app as their plane circled and circled overhead, only to peel off 20 minutes later and begin its flight route back to New York. Thanks to a little (okay, a lot) of fog, what was meant to be a 35-minute puddle jump in the air, turned into a 6-hour ordeal. And Martha’s Vineyard continued to live up to its reputation as one of the most annoying and risky places to travel for a weekend. Luckily our friends are troopers of the highest order, and rebooked for round two the next morning. And they were even gracious enough to pretend that by having saved the strawberries, it had all been worth it. On our end, we tried our best to pack in as much of the MV highlight reel as possible in a short 24 hours. There was cold brew and the island egg roll lady’s famous egg rolls at the West Tisbury Farmer’s Market. There was a cliff-side beach walk and high stakes stone skipping competition. There was a rose-filled sunset. And of course, there was my mother’s famous bluefish, which I have now re-appropriated as my own famous bluefish. Everyone departed yesterday, including Charlie, and I’m nursing my lonesome sighs with the last handful of strawberries left behind with me. You’ve heard me say it before, but I’ll say it again for the cheap seats: Brazil nuts are one of the best edible thyroid supplements around. They have the highest naturally occurring dose of selenium of any plant, which plays a critical role in the conversion of the primary thyroid hormone (T4) to the more bio-available version (T3), and is essential for protecting against the toxicity of too much iodine in your diet. Unfortunately, Brazil nuts are also not the most coveted in the nut kingdom for texture or flavor. They’re usually left at the bottom of the party mix bowl. And several HashiPosse members have complained to me that eating one every morning truly feels like taking medicine. I’ve found that the best way to deal with the chalky texture and bland flavor is to chop finely or pulverize them into crumbs and then toast until nutty. 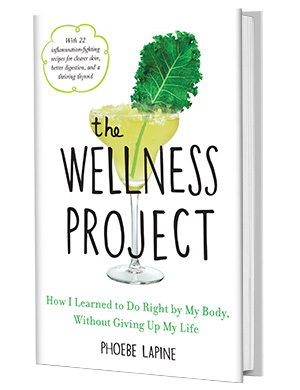 There’s a recipe for Brazil nut pangritata in The Wellness Project book that’s become a favorite. 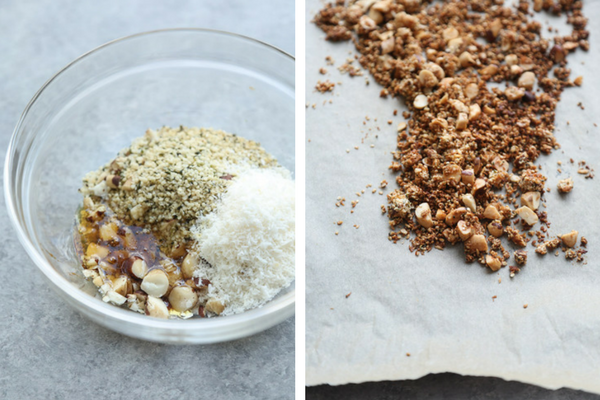 Now I’m adding this grain-free crumble to the mix. 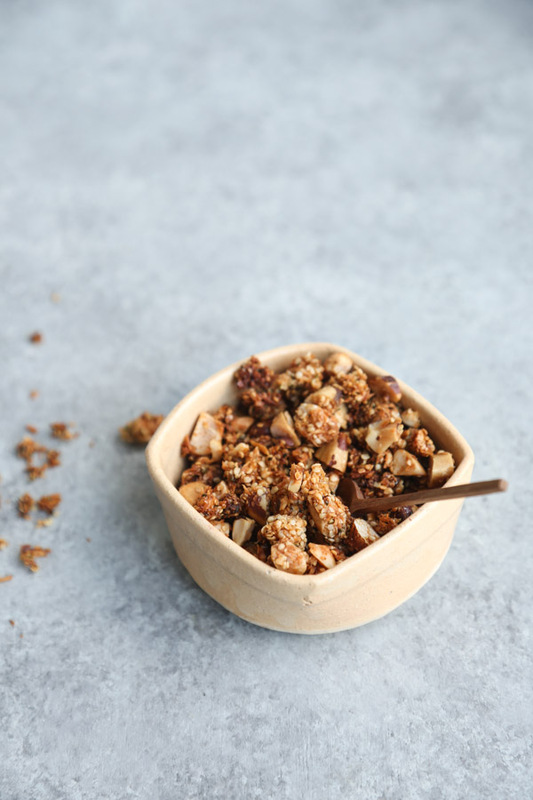 The brazil nuts get tossed with honey, hemp seeds, and coconut and roasted in the oven until crispy and caramelized. The result reminds me of the clusters in Honey Bunches of Oats (i.e. the best part). You can sprinkle it on anything – even soups and salads. 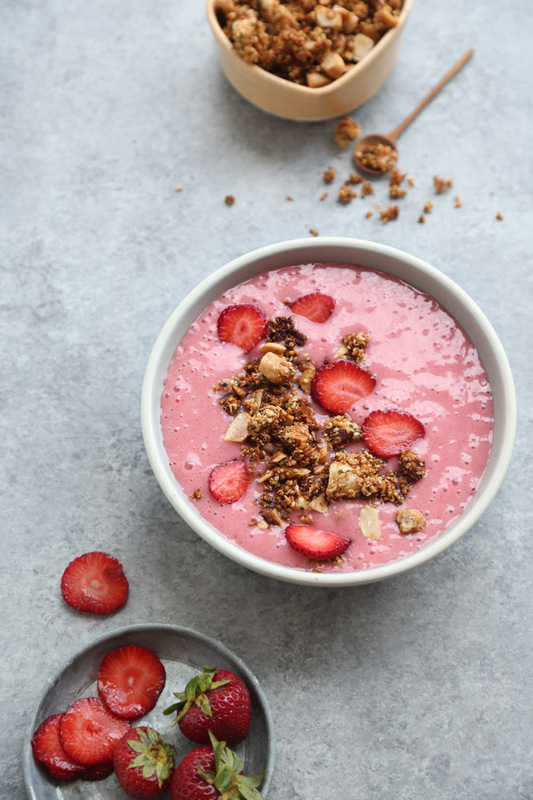 But I love the way it tastes in this creamy strawberry smoothie bowl. p.s. If you’re on the Cape this weekend or in the Boston area, come hang out with me on Nantucket at the Follain store! I’ll be doing a little happy hour meet and greet/talk this Friday from 4-6pm. 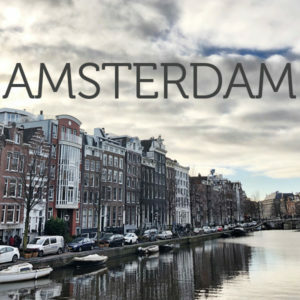 RSVP here (it’s free)! 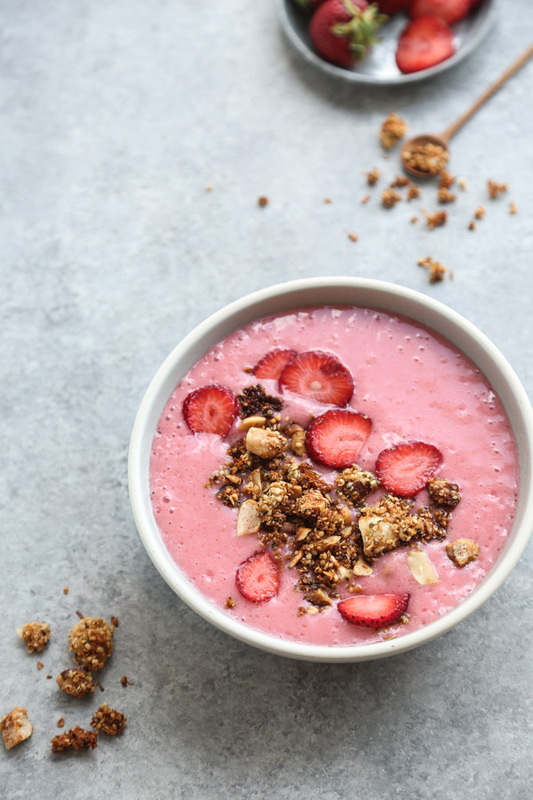 The crunch will serve up to 4 bowls—a week’s worth of smoothie add-on’s!—or you can store the extra and use it to top salads, sorbet, yogurt or anything else you fancy! In a medium mixing bowl, combine the hemp seeds, coconut, Brazil nuts, honey and salt. Make sure it’s well-mixed and the nuts begin to stick together in clusters. Transfer to a parchment-lined baking sheet, arrange in an even layer and bake in the oven until the seed mixture is lightly browned, 10 to 15 minutes. Begin watching after 10 to make sure they don’t burn. Remove from the oven and set aside to cool completely on the tray. 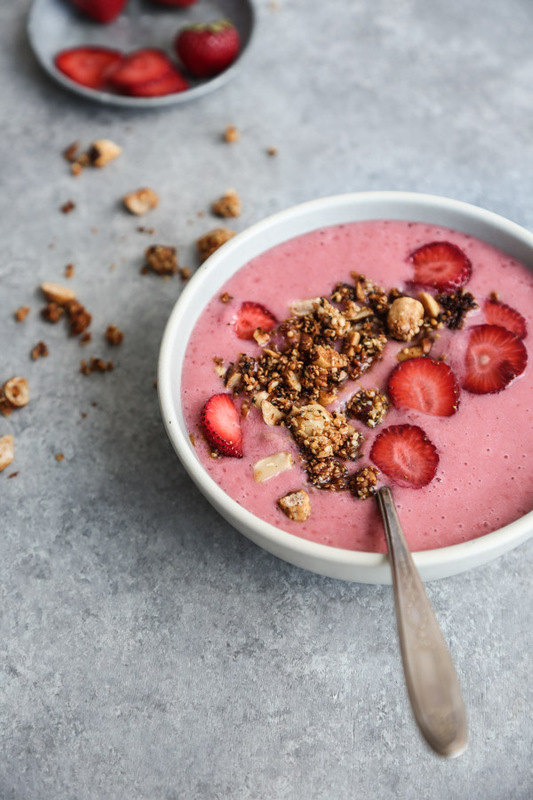 Meanwhile, make the smoothie bowl: add the strawberries, banana and Pacific Foods Organic Coconut Vanilla Unsweetened Non Dairy Beverage to the bowl of a blender or food processor. Puree until smooth, adding more ice as necessary to create a thick frosty consistency. 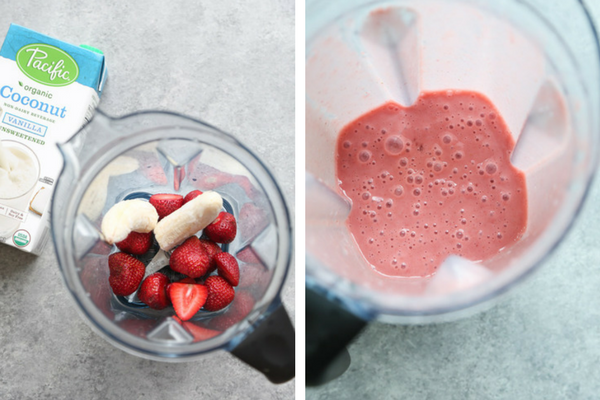 If your strawberries and banana is not frozen, add a handful of ice cubes to chill the smoothie and thicken it to a consistency that can be easily eaten with a spoon.